Four MAC teams are in post-season play. One in each tournament. Of course, the one we want to watch is Buffalo. They have a real shot to get to the Sweet 16 or further, and last year's win over Arizona gives them a great deal of confidence. That's an experienced, senior-led team. They were seeded #6, which had some Buffalo fans upset on Twitter. I think that's a little unreasonable...and it is the highest a MAC team has been seeded since the tournament expanded to 64 teams. They play Friday at 4 against the winner or AZ State or St. John's. If it's the Sun Devils, that sets up an interesting match up between Buffalo and their former coach. Lastly, in the CIT..Kent is @Louisiana-Monroe, Thursday at 8 pm. As you know, BG opted to not accept any bids once the NIT selected someone else. I've already said on Twitter that I support the decision...in the sense that if the players and coaches don't want it, they shouldn't have to do it. The tournaments mean nothing and BG left everything they had on the floor at the Q. Some people have also asked me about not getting into the NIT. A couple of things. First, the NIT already has to take every regular-season team that loses their conference tournament and didn't get into the NCAA. By definition, those are all mid-majors. The NIT is owned by the NCAA, and that's about all the mid-major they are going to be able to take. Even assuming decisions are made rationally, BG's losses to Hartford, Detroit and Cleveland State make it tough to get an at-large bid. BG finished with a kenpom of 106 and the lowest ranked team in the NIT as an at-large was Wichita State at 93. And there it is. Presumably, after hearing that BG had not received an NIT bid, the Falcons announced that they would not be playing any further. Coach Huger had originally said BG would accept a post-season bid that wasn't the NIT, presumably the CIT. However, given a day to think about it, BG declined the CIT bid. I saw some interesting comments on twitter from Brent Klassen today...his point was that the players don't want to play in the games and no one cares, so it would be better to let it go. And, if their heart is not going to be in it, then I don't think it makes sense to go through the motions. More to come, but it was a great year. Thanks to the Falcons players, coaches and staff who work so hard. You gave us a lot of thrills and pleasure. Thank you. Now 51 elapsed years since BG has been in the NCAA tournament. Here is the company we live with now. Sadly, this list remains static this year...but maybe a light at the end of the tunnel? So here we are. It didn't work out. More on that in a minute. We may have lost, but we are not beaten. Those guys had such a year and I was so proud of their performance all year and in this game. I was proud to clap them off the floor. Winning would have been great...incredible...and not because we don't respect Buffalo but because we do. It didn't happen, but we got closer than we have in 17 years and I think we are building a true program and these guys--the guys we have right now--did something pretty cool and I hope they enjoy it for their lives. Nothing but love here. What a great year. BG gave Buffalo all they could handle. Buffalo made a couple runs and BG always brought it back. This Bulls team is so good. The last team in the MAC that was better beat us in the MAC Final that year, too. Massinburg is two-time POY. Jeremy Harris? Are you kidding me? And Nick Perkins is your third best player. The Bulls are a machine. When you turn the ball over, your first thought is they are going to come down and hit a 3 and in the blink of an eye you're down 3 more. More on the Bulls. They've won 4 out of the last 5 titles. That never used to happen. How good was Akron every year--and yet, it's hard to win that tournament consistently. Buffalo is on the verge--if they keep it together--of becoming the Gonzaga of the East. Great program, mid-major conference, win big games in the non-conference...they are on that kind of path. So here's the thing. That's how good the MAC needs to get. You can see it. We are not there yet but we can get there. Competition makes us better. So, with 4:25 minutes left in this exact game, BG was down 3. That's a one-possession game. From there on in, UB went 13-2 and put the game away. That included a 12-0 run that put the game away. BG obviously had nothing...two turnovers, two blocked shots, one missed front end and two missed shots. Honestly, in two possessions, the game went from competitive to over. That's what you have to do to win championships. In crunch time, Buffalo won every battle. Tip of that hat. Against a team that good, two bad minutes can kill you. There were positives. UB outshot BG. The Falcons shot 46% from 2FG and 27% on 3FG. BG is 1-9 in games where they shot under 30% from 3FG. 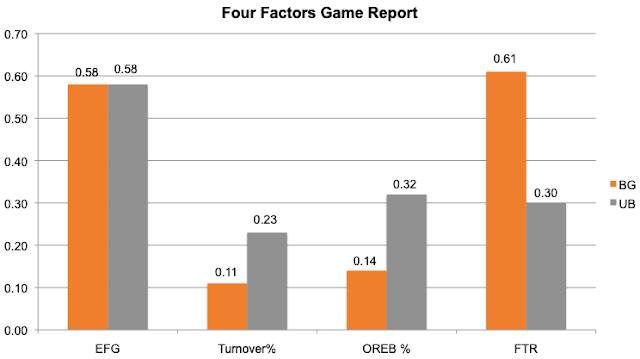 Buffalo had a significant advantage on turnovers as well. The key thing for BG was rebounding, which was considered a big issue coming in. BG dominated the game on the boards, and if anything failed to convert those offensive rebounds into the easy baskets they are supposed to be. Lastly, Buffalo was 16 of 21 at the line and BG was 10 of 15. Overall, BG scored .99 points per possession in the end while UB scored 1.18. If you could do either one of them, you'd be in good shape. I have no idea where it was with 4 minutes left, but probably a lot closer. Individually, Daeqwon Plowden had a huge game--a good portent for the future. He scored 16 points, shooting 7 of 9 and 2 of 3, 8 rebounds and a steal and a block. And the top MAC highlight of the year, according to the video board. Justin Turner also had 16, but he had to work at it. He shot 5 of 21 and 2 of 7. He had 3 assists and 3 turnovers. Demajeo Wiggins had 13 points on 5 of 7 shooting and 10 rebounds--but was 4 of 8 from the line...no turnovers. Michael Laster had 13 on 5 of 11 shooting and 5 rebounds. As a team, BG had only 6 assists. One other note. Coach did tighten the rotation up. Wiggins played 35 minutes, for example. It was his most minutes all year...he played 34 @Ohio U. Plowden played 32 minutes, his season-high. Meanwhile, Lillard played 10 minutes and Uju 2--both their lowest of the year....and Sierra played 7, his lowest since the Toledo game. So, BG opted to reduce their rotation from 9 to, essentially, 6 or 6.5. That's a surprise, especially on the third straight night of playing. I would guess that Coach Huger wanted to match UB's talent level and felt he needed a shorter rotation. We'll never know, but part of the price might have been the slow close. Or, if you play a bigger rotation, you're not in the game at the end. But BG clearly used a different pattern than they did the rest of the year. So, we await the news about our next step. We'd expect to be in a tournament. I don't think we're in the NIT and I don't think UT is a lock. But, hopefully, we get a shot at one of the other two and Coach says we will accept, which I think is the right call. More to come on the year as a whole and our matchup, etc. For now, just appreciation for what was probably our best year since 2002. Can't wait until November. Wanted to check in with the nation. CAN YOU BELIEVE IT??? What a run this has been. How many games have we set through, for 17 years, seasons ending on Mondays in Mt Pleasant? Here we are. One game from The Big Dance. Yes, we’re underdogs. But it’s one game and we have beaten them. Why not? Beyond that, stop to remember. Remember how it felt after the Cleveland State game. Or when we were picked last. Or, remember how many years we have dreamed of being in this position. Again. Me? I was at the first MAC Title game. We lost to Toledo. I was at the one WE LOST ON OUR HOME FLOOR. I’m dying over here. I cannot wait. Let’s back our boys. Note: read David Briggs in The Blade for a great column on this. Let’s back our boys. And enjoy the ride. Quick post here due to time constraints. BG thrilled their fans last night with a quarterfinal win over Ball State. Coupled with UT's defeat, there's a clear path to the finals and I think the nation is pretty excited. A couple thoughts about the game. First, it was the fastest pace game BG has played all year at 82 possessions. So, when you see that Ball State scored 86, you have to take that in context. At 1.05 points per possession, it was BG's best defensive game since the Akron win. That was better in the 2nd half, when BG held the Cards to 35 points. Meanwhile, BG shot the lights out. It was their best offensive game and shooting game since the NIU game in DeKalb. Had BG shot free throws even marginally well they would have broken 100. I don't know if BG's strategy to winning the tournament is to run and gun. We shall see. Both teams had a significant player missing. KJ Walton was injured in the first half, missed time and never seemed like himself. Meanwhile, Justin Turner had 2 fouls, missed most of the first half and finished with 10 points and BG still scored 99. Side note. When it comes to playing guys with 2 fouls in the first half, Coach Huger is one of the most conservative in the country. Of the 351 coaches, only about 40 are more conservative. Demajeo Wiggins had his best game in a while. He tied his season high in points with 22 and had 11 rebounds. He made 9 of 11 shots. First time around, he struggled with Ball State, so it was great to see him step up and play the game we need him to. Dylan Frye, who has really struggled, had his best game in a while, scoring 20 on 5 of 7 and 2 of 3 shooting. Raise your hand if you expected Frye to score 20 with only 3 3FGA. Me either. Anyway, it wasn't perfect but it was good enough and there's only two things in tournament basketball...survive or don't survive. NIU is next in the late game tonight. They shocked Toledo last night....check out the video of the post-game presser if you want to see David Briggs get ALL THE WAY under Kowalcyk's skin. BG played NIU once this year, beating them by 20 in DeKalb on a game where all the shots went in the basket. After the UT win, Coach Montgomery noted the difference in his team over the last few games, when they are 5-1. Those were all MAC West games except for the OU tournament game on Monday. They beat CMU and Ball State on the road and then OU and UT in the tournament. Obviously, we all know BG can't sleep on anyone. Hopefully, the situation itself will keep that from happening. NIU is going to be riding some momentum, to be sure. On the other hand, it doesn't get easier. Eugene German--who would have been on my All-MAC first team--had a big night against UT, making some (in Kowalcyk's words) "unguardable" shots. Levi Bradley had a good game against UT and has been playing well through this run for the Huskies. Tempo will be key. NIU plays at the 11th ranked pace in the MAC. If BG can force misses and get the tempo going, I think they should be able to get this one. If BG plays with energy and tenacity, I think they should get this one. Even as relieved (let's be honest) as we are not to be playing UT, the Huskies are playing well and are not the same team we saw in February. We don't want to fall victim to the same thing UT did. So, in the late game BG will face the Ball State Cardinals at the Q. Interestingly, because the MAC doesn't re-seed, BG is playing the lowest seed still in the tournament, which is #11 Ball State. Ball State had a very rough year. They were picked to be among the top teams in the West, they entered the MAC season with a top 100 Kenpom and they would appear to have talent on the team. However, that did not work out. It was a rough year for them. Just as an example, when BG beat them by 1 at the Stroh earlier in the year, your first thought was how helpful that would come in tiebreaker season, not that BG would finish six games ahead of them. Before we get into the preview, let me just say that if BG brings the game they brought against Kent State or others, this is a game they should win. If BG brings the game it brought against Akron, then Ball State will advance. In other words, winning or losing is in BG's hands. Ball State does not enter the tournament playing well. They have lost five of their last seven. They made it this far by beating EMU on Monday in Ypsi, an 18-point thumping featuring the two most mercurial teams in the MAC...even the game was that way. Ball State scored 23 points in the first half and played like a team that would have preferred to be doing anything else, but then in the second half it turned out EMU wanted it even less, scoring 14 points, and 2 in the first 10 minutes of the half. The first time the two teams played it came right down to the wire. If you recall, BG had to struggle to get the ball in and Persons hit a buzzer beater to cut the lead to 1....it was more of a 4-point difference. We were very happy to win that game at the time. Here's how it went down. The odd thing is, BG shot terrible. It was the worst BG shot in a win all year. The next worst was 47%. BG saved the game with offensive rebounding and FTs. BG was 29-33 at the line (an uncharacteristic success rate) and +10 at the line. Turner scored 26 and Plowden 20 and Wiggins had 15 boards. For Ball State, Persons had 28 (his MAC season high) and Teague 19. Trey Moses was held to 3 points. So, it's been a while, but let's catch up on the Cardinals. They are more like Akron than other teams. They are a poor offensive team (11th in MAC)...as in one that shouldn't shoot like you see above, but they are very good on defense (3rd). So, it's a test of who wins out, the team that can score or the team that can't. Now, look, BSU is underwater--they allow more than they score, which is what you get with an 11th place team...and BG is right side up. If BG plays anything near its average defensive game, they should be able to win this one. So, what's the deal with their scoring? BSU is poor across the board. They are 11th in shooting, 9th in turnovers and 9th in offensive rebounds. They are last in the MAC in terms of trying 3FGs and last in terms of making them. They are better at 2FG, ranked 3rd, so BG needs to defend the paint very effectively. BG is 9th in the MAC right now in defending the 2FG. They are also not great at the FT line. They are 7th in getting to the line and 10th in FT shooting. Flipping it around, their defensive success is mostly built on stopping the shot, the most important factor. They are 3rd in the MAC in defending the shot. They are 2nd defending the 2FG and 4th defending the 3FG. You'd hope BG gets some stops and gets into transition. Little hint, if you see BG get frustrated and start jacking 3FGs up, then you can start wondering how Ball State will do in the semi. The Cards are just typical at the other things...6th against turnovers, 7th on the defensive boards and 6th in allowing FTs. Ball State has some very solid players. Their highest profile player is probably overrated. Tayler Persons leads the team in scoring at 16 PPG. However, he shoots 42% and 28%. He leads the MAC in the percentage of his team's shots he takes. What about assists you ask? He's only 6th in the MAC with an essentially 1:1 A/T ratio. Tahjai Teague is a really solid player. He's scoring 12.9 PPG on 50% and 24% shooting. He averages 8 RPG, which is 4th in the MAC. Even tempo-free (the BSU defense does create a lot of missed shots) he's top ten on the defensive end. He's also 13th in steals and 8th in blocked shots. He's a good player. Their other double figure scorer is KJ Walton, who shoots 12.3 PPG. He shoots 49% and essentially never tries a 3. He's third in steals and first in steal rate. The surprise guy is Trey Moses. He was third team all-MAC last year, but scores only 8 a game on 46% shooting to go with 7.6 RPG this year. He was injured for a couple games. So, the second season begins. By seeding, BG should be set to advance. Having said that, if BG doesn't play well, the Cardinals are capable of closing BG out in a game that would likely be very low scoring. I know this isn't going to play well in our base, but I'm going to tell you it's probably the right call. Most years, the Coach of the Year is synonymous with "most improved team." Based on that measure, Huger wins in a landslide, after being picked last and then finishing #3. But when you have the coach of the team that has been ranked most of the year, would qualify for an at-large bid and is the best team in 15 or 16 years in this conference, then you have to recognize that guy as a pretty good coach, too. I don't think you can argue it. Tip your hat. Our guy had a good year, too, and might have won most other years. He gave us a great year when we were competitive and relevant for the first time in a long time. The MAC announced the all-conference teams, and I think it was a fair shake for everyone involved. From the BG perspective, Justin Turner deserved to be a first-team player and he is. Note that he's the only non-senior on the first team and there are no juniors. Massinburg and Perkins have to be there. I'd expect Massinburg to be POTY. The only first-team guy I have quibbles with is Walker, who led the league in scoring but did it through jacking up a shload of shots. He was the #42 shooter in the MAC. To me, that's not a first-team player. I would have elevated Thompson or German ahead of him. Wiggins was on track through December to be first-team as well, but his conference play was just not as good. He was third in rebounding and first in tempo-free rebounding, but only averaged 10.3 PPG in conference play. He had a great year and certainly earned second-team honors, which he got for the second straight year. I had hoped Caleb Fields would be all-FR, and I thought he had a better case than Edu, but that would be it. He is a very solid player who I think will develop at BG and become a really good player. C.J. Massinburg, G, Buffalo, Sr.
Nick Perkins, F, Buffalo, Sr.
Jaylin Walker, G, Kent State, Sr.
Jaelan Sanford, G, Toledo, Sr.
Demajeo Wiggins, F, Bowling Green, Sr.
Jeremy Harris, G, Buffalo, Sr.
James Thompson IV, F/C, Eastern Michigan, Sr.
Eugene German, G, Northern Illinois, Jr.
Tayler Persons, G, Ball State, R-Sr.
Shawn Roundtree Jr., G, Central Michigan, Sr.
Nike Sibande, G, Miami, So. Jason Carter, F, Ohio, R-So. Seth Dugan, C, Western Michigan, Sr.
Daniel Utomi, F, Akron, Jr.
Paul Jackson, G, Eastern Michigan, R-Sr.
Elijah Minnie, F, Eastern Michigan, R-Sr.
Nate Navigato, F, Toledo, Sr.
Marreon Jackson, G, Toledo, So. Anthony Roberts, G, Kent State, Fr. Mekhi Lairy, G, Miami, Fr. Ben Vander Plas, F, Ohio, Fr. Jason Preston, G, Ohio, Fr. AJ Edu, F, Toledo, Fr. Dontay Caruthers, G, Buffalo, Sr.
Davonta Jordan, G, Buffalo, Jr.
Darrian Ringo, G, Miami, Sr.
And there it is. 18 regular season games played to establish this. Not much point in writing too much about last night's game. Here's the thing. When BG gets smoked (especially on defense) by OU, Miami and Akron, that's a problem. Last night, they were beaten by the best team in this conference in 16 years who haven't lost at home in almost two years...on their senior night. Toledo lost by 30 @UB. The Falcons fell way behind and battled back and got into the game, which many teams have not in a similar situation. Again, lose by 24 @Akron is bad. Lose by 13 @UB not so bad. BG finishes #3. This is the second best regular season since WVU. We'd take this any time. I will have a post later about what I think the program should aspire to. Yes, we want to make the tourney, but what we want way more is to be in the hunt every year or almost every year. In fact, you have to be in the hunt every year to get the dice to tumble your way at the Q once. In the meantime, the regular season has no meaning. Literally. UB has clinched an NIT bid if they don't win the tournament, but they will be in the Dance either way, so it doesn't matter. For the other 11 teams, it's a new beginning. I got half of my wish with BG's draw. I was hoping to avoid EMU and OU. So half was avoided. OU is playing well and I like them @NIU on Monday. (Side note. Firing Phillips in my opinion would be a huge mistake. He's got two of the top FR in the MAC, I think they'll be back. Anyway). EMU is in our draw, hosting Ball State. EMU beat Ball State twice, including one game at Ypsi on March 5. BG beat both teams when they played during the year. First, BG has to focus in that quarterfinal game. Either EMU or Ball State is capable of beating the BG team that has shown up and lost three of the last four. If you want to tell me that we didn't have anything to play for, fine. Or we were in a cold streak. Whichever. If BG plays that way, they won't get out of the quarterfinal. Then, we see how hard it is to win this title. You're going to (in all likelihood) need to beat Toledo and Buffalo on consecutive nights on a neutral floor. That's the deal. That's the only route and it is incredibly hard. And it isn't going to be easier next year or the year after. That's why the first goal has to be to get in this position most of the time. Here's the other thing. Sometimes it happens. If we see the BG team from earlier in the MAC year, playing intense defense and making shots, then we should beat EMU or Ball State and we absolutely can beat UT. Then, you're in the final game, and you just need to have one of those magic nights, but it's down to one game. So, as I have said all year, let's enjoy the ride. Bowling Green defensive lineman Kyle Junior will transfer, the school says. He led the team in TFLs and QB hurries last year. Josh Croslen, who made 9 starts along the line, already was in the portal. So, this news from The Blade this morning. No big surprise...in fact, if anything the surprise is that there haven't been more people leaving with the change in coaches. Keep in mind, though, that the new staff is putting a new culture in and that can lead to other departures as the program rebuilds...and make no mistake about it, that's what we are doing. The Junior loss is big, no doubt. He was the top performer on an already decimated defensive line. Croslen was off the depth chart by the end of the year and was up from Steele, so maybe not too much of a surprise. Wish both of them the best. They get to make choices about their life just as we all did. Spring practice starts tomorrow, so everyone gets back to work. It's going to take a little time to do it right, but I have a feeling we're on a much better path. So, it's been 119 days and the last regular-season game is at hand. It's been a great season, with BG set to finish no worse than 3rd in the MAC. The Falcons will end the season with their toughest game--a game at the Buffalo Bulls. They are the #19 team in the country based on the polls. They are 23rd in the Kenpom. And, of course, in the highest point of the season for BG, the Falcons beat UB by 4 at the Stroh early in February. It was BG's biggest wins in years, because this Buffalo team is no joke. They are the highest rank team since that Kent team in 2002. They are 27-3 and are set to win the MAC by at least 3 games. They lead the MAC in offense and defense. They are the #17 most experienced team in D1 basketball. Since losing to BG, they've won the next 8 games. They've won 25 straight at home, including all of the games this year. Their last home loss was December 2 of 2017 to St. Bonaventure. And, of course, they beat Arizona in the NCAA Tournament last year. They will enter the MAC Tournament as prohibitive favorites and even if they don't win, they'll end up in the big dance as the first MAC at-large in 20 years. These guys are very good. And yet, the Falcons harnessed the home crowd and delivered the big win. How did it happen? First, BG matched UB in shooting. Then, BG reversed the normal UB trend and did twice as well on turnovers as the Bulls. BG was smoked on the boards, but made it up with a big difference at the free throw line. Frye had 25, Turner 22 and Wiggins 17 (on 11 made FTs). CJ Massinburg leads the Bulls. He's the returning MAC Player of the Year and I would expect him to win it again this year. He's the most efficient offensive player in the MAC and #14 in the country. He's 8th in shooting the 2FG, 12th in shooting the 3, #11 at the free throw line. He's 6th in turnover rate. He's a complete player and the best in the MAC. They also feature Nick Perkins--almost certain to be the 6th man of the year--Jeremy Harris, Dontay Carruthers. They are deep, they keep you under constant pressure and have no holes in their game. They beat Ohio U by 47 a couple weeks ago. If BG plays like they have in 3 of their last 4 games, that's what will happen in this one, too. BG is a 14-point underdog and will need to play as well as they can play to be competitive in this one...on the road. In a sense, it doesn't matter. BG will be #3 when the tournament opens. But you don't want to have to turn it back on again after a weak effort in Buffalo...so let's hope the Falcons play with the kind of 40-minute intensity it will take to be competitive. Well, that was ugly. It was ugly without consequence, but it was ugly. BG played probably its worst game of the season in Akron, I don't think there's much doubt about it. Akron came in as the worst 2FG and 3FG shooting team in the MAC, and against BG they shot 70% and 45%, their best shooting game of the MAC schedule. It was their best offensive game of the MAC season as well. And it is the third time in recent days that BG has been torched by an offensively-challenged team. 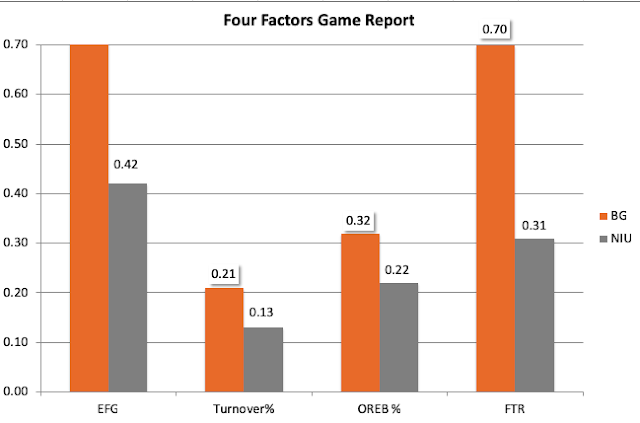 Meanwhile, BG had its third-worst offensive game of the year, worsted only by VCU and @Miami. They shot 36% from 2FG and 28% on 29 3FG attempts, which is just not the way that team is going to win. A few times BG got into the paint and the shot got rejected and they seemed to avoid it after that. That's the most 3 attempts by BG in MAC play. They also made only 11 of 19 FTs. Wiggins played only 15 minutes. Frye had an awful shooting night. Lillard and Laster, too. And no one can possibly have been defending anybody. BG is almost certain to finish 3rd in the MAC. Which is a good outcome, any way you want to slice it and something we have rarely achieved in recent years. The question from here is what will happen in the MAC Tournament. BG has played bad basketball in 3 of the last 4 games. When they needed it, they rallied against Kent State in a meaningful game. Coach said BG "got ahead of themselves." And all this is fine as long as they come back to playing at the level we know we can play at in 8 days. If not, it's going to be a short trip to Cleveland. As mentioned, BG is likely to be #3. To get #2, BG would need to win @UB and then have EMU beat the Rockets at Savage. Note, that #3 sets BG up to be in the latest games Thursday and Friday, if you want to drive over from BG. So, at #3, BG would play the #6 and #11 seeds. Right now, that's EMU vs. Ohio. That's not for sure. You could end up with a 3-way tie, CMU, EMU and AK...in that case, I think BG plays AK with CMU in #5. If CMU and EMU end up tied, CMU wins the tie breaker and BG plays EMU. If AK and CMU tie, I think AK gets the nod for #5 because of the BG game, and BG would play CMU. Similarly, OU and BSU could still finish 10th/11th. If that happened, OU would get #10 as they beat BSU twice, believe it or not. For my money, I'd rather not be matched up with OU, who is actually playing pretty well. I'd rather not play EMU, either, just for freaky zone reasons. Beyond that, these are pretty even teams and the biggest variable is which BG team shows up. But, again, the matchup won't matter if BG doesn't bring the focus we are used to seeing. So, the final week of the regular season is here. BG has played its last home game and starts the week at the JAR. Akron is struggling. They've lost 6 out of their last 8 and 5 out of their last 6. They were just bludgeoned on Saturday by Ohio U, in Akron. The Bobcats won by 24. Nobody would have seen that coming. The Zips are 6-2 at the JAR in MAC play, which is pretty normal. The two teams played just a couple weeks ago, with BG winning a buzzer beater on home floor. Here's how things shook out. It was more of a defensive struggle, with neither team shooting well and BG getting a slight advantage at the FT line. You'll recall this is the game where Justin Turner went nuts in the second half and essentially took the game over. So, not much has changed in terms of the matchup, so I'll just point you to the breakdown from the previous game. Just to recap, Akron is the worst offensive team in the MAC and the 2nd best defensive team. They are last in shooting the 2FG and the 3FG. They are last in offensive rebounding and they are 11th in getting to the line. This is a team that struggles to score points. We've seen BG allow offensively challenged opponents to score in the last couple weeks, so BG's first challenge is to keep Akron off the scoreboard. On the other side, Akron is the hardest team in the MAC to shoot against. They are the hardest to shoot the 3FG against but only #6 against the 2FG. My diagnosis here would be that BG needs to play the kind of offense they played against Kent...get to the rim and then shoot the 3FG off ball movement. If you see the Falcons jacking shots up, you know we're in trouble. I talked before the last game about slaying Zip dragons. The Zips have won 18 out of the last 20 with BG and before that 2009 win there was another long winning streak. BG has lost their last 9 at the JAR and there was that 2009 win and then before that BG had lost 3 in a row. So, 12 of 13 at the JAR. This is a chance to turn that around, too. Akron is tough at home, but BG needs to be tuning up to play at a high level and getting this win on the road would fall in that category. I'm not sure how Akron will react to getting killed by OU--those things can go either way--but it will probably keep the home crowd down. AK is in the bottom 50 in the NCAA in terms on bench minutes....in the past, BG teams have been in that situation and it just wears a team down, so maybe that's happening. Either way, this is a tough assignment and an opportunity for BG to show themselves that they still can string tough wins together. So here is the reset. The top three in the MAC are set. Buffalo, BG and UT will be the top 3. The order is yet to be determined. It isn't hugely significant anymore, but it does matter a little, depending on how things play out. Winning the regular season is banner-worthy and also means the NIT is in play, although if Buffalo wins #1 seed that will be moot because no one thinks they aren't in the NCAA already. There's still a chance for BG to win the title. BG would need to win out and UB lose out, necessitating a BG win in Buffalo to end the season along with a Bull loss @OU. But that would do it. Probably the more likely scenario is that it shakes out for BG and UT to be in a semi-final collision course. If BG wins out, they can't do worse than second. However, should BG lose one of the last two and UT wins out, then UT would be 2 and BG would be 3. UT has a much easier road coming home, with WMU and EMU, both at Savage. Again, whether you finish #2 or #3 doesn't really matter, except we tend to forget that pesky quarter-final game. We can look at who we'd play if things ended today but you can see it's pretty jammed up. There's no team better than another team in there, but there might be better matchups. For example, if BG is #2, they would play the winner of #7 and #10. Right now that would be Miami or Ball State. Miami has beaten BG twice, not sure how that plays, I'd think OK though. I honestly think after the last game that BG would beat Miami. If BG is #3, they would play the winner of EMU and Ohio. You'd like to avoid EMU if you can just because they are so unpredictable and the zone is like a wild card thrown onto the table. Also, you want to avoid a hot team, which OU might be becoming. Anyway, there's a lot to be sorted out before that happens. The key takeaway is that BG has to be focused in the quarterfinal and then probably will have to beat UT and UB on consecutive days to win the conference. That's a tall order and illustrates how hard it is to win a title. But it could happen. That's the fun of it. And it's great to be looking at this part of the standings at this time of year. The Falcons saved a good performance for their last Stroh Center game of the year, capping off a fantastic home season with a gritty win over a Kent State team that played really hard and was highly motivated to get a win. It was a very satisfying way to send them off. BG clinched its first bye through the first round in 10 years. That's amazing. BG now has won 20 games for just the second time since Dakich Part II. That's worth mentioning. REGARDLESS OF HOW BG WAS PICKED THIS YEAR, this has been among our better seasons in recent memory. If we had been picked to finish third in the MAC, this would be a great year. The fact that it came unexpectedly just makes it better. So proud of this team. There was a decent crowd last night and the team rallied impressively from a rough couple games. The "urgency" was there for sure. Coach Huger, who made an effort to look relaxed before the game, was noticeably tense during the game. The first half was competitive for the first nine minutes. BG was up 16-15. Over the next 6 minutes, BG outscored Kent 13-0, leading by 14 with about 5 minutes left in the half. Inside of 2 minutes, the lead was still 12, but Kent scored the last 5 points to get the lead inside 10 heading into the locker room. BG did not score for the last 3:26. BG bolted the lead back up to 11 early in the half, but Kent held the line and then gradually chipped away at the lead until they tied the game with 11 minutes left. They took the lead by 1 with 9:29 left. When BG took the lead back with 8:30 left, they lead the rest of the way, but it was a real battle for those last 8 minutes, much of which took place in a one-possession game. But, it's worth noting that BG was holding the lead and in control of the action for that period of time. A key point in the game came with about 4 minutes left. BG was up 1 with the ball. Walker was whistled for a foul on Turner and Senderhoff, who had been melting down regularly on the KSU bench, was called for a T. BG made 3 of 4 FTs and it was then a 4-point game. Moving forward, BG was up 3 with 2 minutes left. BG got a missed stop and cleared the board, which is important, because Kent abused BG on the offensive glass for the game. Kent fouled Wiggins, and with 1:57 left, he missed both FTs. On the other end, Walker missed a 3FG, but Whittington converted the rebound to cut the lead to 1 with 1:36 left. Big possession for BG. A basket is needed. BG runs the clock to 1:18 and Plowden converted a "layup" that was pure will and strength, launching the ball from about a foot below the rim and getting it in. Kent comes down. BG covering well and Kent is having a hard time finding a shot. Avery missed a 3FG but Walker corralled the rebound and your eyes are JUST closed as he rises up but he misses and Laster rebounds and Lillard is fouled with :41 left. Lillard was about to score and Walker just freight-trained him to get the foul. Lillard split the pair, but it's still huge because now it's two possessions. Here, BG took an interesting strategy, which was to foul Walker rather than letting him shoot. Very interesting. You figure he might get to the basket for 2 and he might hit a 3 and then it's a big momentum play and instead you make him stand at the line and it's still 1-1 and he might make a couple FTs (and he's decent at the line) but it takes all the fun out of it. So Walker misses the front end and they get nothing, Wiggins clears the board and Turner is fouled with :28 left. He splits the pair, but BG's up 5 now. Walker is fouled again, makes them both and cuts the lead to 3 with :23 left. Wiggins takes the inbound and is fouled. He splits the pair to go back up 4 with :22 left. Walker came down and missed a 3FG, got the board and missed another one, and then Wiggins had the board after some volleying and he was fouled with :10 left and then you're reserving your hotel room in Cleveland. He made one more and BG led by 5 and 77-72 was the final. Yes, BG needs to shore up that late FT shooting, but they had the lead and defended well and gutted the win out. Walker missed 4 3FGs in the last 2 minutes. So here's how it rolled out. We all knew BG had to play better defense. And they did. 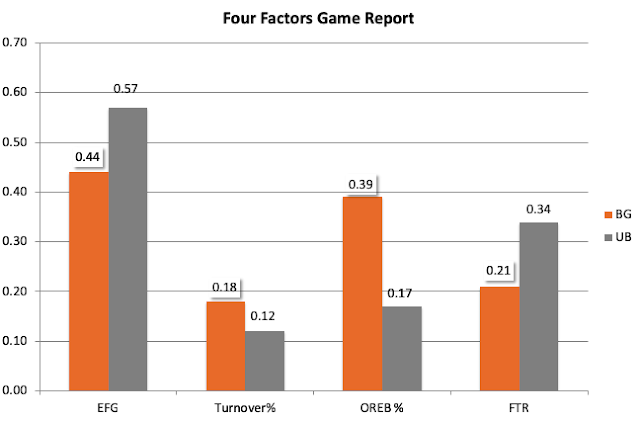 They didn't play great defense, but against a good offensive team BG held them to 1.07 points per possession, better than both of the last two games. Kent just got a ton of easy layups during the second half and they finish well. They shot 53% from 2FG but only 24% from 3FG. So, with sub-par shooting how did Kent end up with 1.07 per possession? Not turnovers, those were nothing special. They did completely dominate the offensive boards. I identified this in the preview as a big issue and Kent just killed BG on the boards. This was BG's worst game at the boards since Ball State in January of 2017. So BG defense was good enough, but the offense was straight-out good. Kent is not a good defensive team and BG responded accordingly. There was a clear strategy to get to the basket. BG shot only 5 3FGs in the first half. They shot only 17 for the game, their lowest in MAC play. BG shot 66% from 2FG, their best of the year. Their 3FG was 36%, which is not great but not awful. 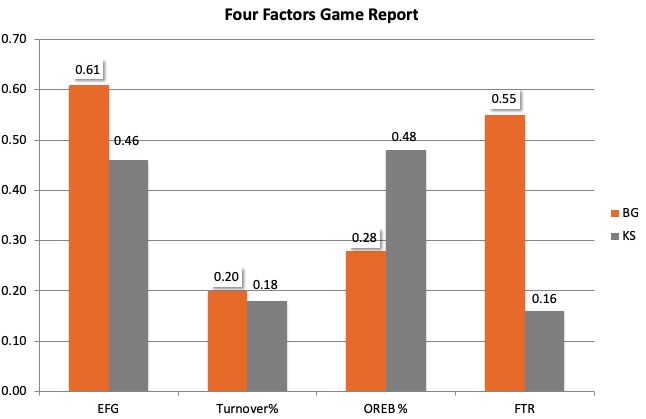 But shot selection and effective finishing at the rim gave BG their third-best shooting game in MAC play. BG had a poor game with turnovers, was about average on its offensive boards, and got to the line a lot but shot only 63% on those. Better FT shooting and the end of this game is not nearly as stressful. Meanwhile, Kent hardly got to the line at all. Individually, you gotta talk about Jaylin Walker. The young man has some moves and makes incredible shots. He scored 26 points. But he used a ton of possessions to get there. He took 28 shots, I about fell off my chair at BW3 when I saw the number. That's a ton of possessions used up. He was 5 of 12 and 4 of 16. Remember, BG only tried 17 3FGs. Now, Kent's offensive rebounding meant those misses were being converted, but he could be a liability if that isn't happening. In a 67-possession game, would you rather have Walker scoring 26 on 28 shots or Turner scoring 18 on 9 shots? Anyway, Turner did lead BG, shooting 6 of 9 and 3 of 4, with 4 turnovers. Antwon Lillard scored 14 on 5 of 7 and 2 of 4 shooting. Wiggins had 13 of 4 of 6 shooting and 5 of 10 at the line. He added 8 rebounds. BG did get better bench play, particularly from Laster, Plowden and Sierra. (BG started their seniors, so Plowden came off the bench.) Dylan Frye played 15 minutes and had a rough night. We've all been there. So, BG prepares to head to Akron on Tuesday. This win was good, but there are clearly still things to clean up in order to win 3 times in 3 days. I'll look at the MAC standings story once today's games are complete.